To perform trustworthy disinfection without losing minerals | Key question | DAICEN MEMBRANE-SYSTEMS Ltd. It is considered manufacturing mineral water in heat sterilization method. However, the amount processed at a time is limited and the running costs such as electricity charges for heating become high. 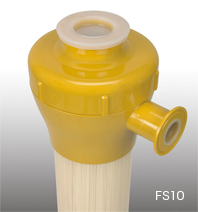 In addition, since there is possibility of decrease or alteration of the minerals in water with heat sterilization, other methods are considered. Is it possible to provide good-taste and high-quality mineral water without loosing the original minerals and flavor of natural water? It is possible to realize treatment which disinfects various harmful germs without losing the minerals and flavor with the hollow fiber module. 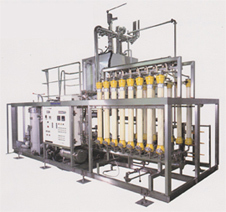 The ultrafiltration membrane (UF membrane) of DAICEN MEMBRANE-SYSTEMS is adopted in many cases of manufacturing high-quality mineral water because of its high treatment performance.